Margot peaked back in the 1930s, and seems poised to rise even higher today. Our Baby Name of the Day comes from Asha, and also appears on this list. Everybody knows Margaret. It comes from the Greek word margarites, meaning pearl. It became Margalit and Margarita, and eventually Marguerite in French. Margot evolved as a short form of Marguerite. Some say the nickname was invented for Marguerite of Valois, who married King Henry IV of France back in 1572. But the Dictionary of Medieval Names from European Sources records it in use at least a century prior to her 1553 birth. What we know is that the queen popularized the nickname and ensured it entered the history books. The French queen was stylish and highly educated. She authored her own memoirs – perhaps the very first work of its kind. But she was also entangled in the controversies of her day. Her marriage was meant to cement a truce in the Wars of Religion. Instead, rumors and scandals plagued their relationship, and they often found each other on opposite sides. Margueriten makes for a complex, intelligent, and capable figure, but we tend to remember her in a negative light. La Reine Margot, written by Alexandre Dumas, père, is the longest lasting of the many tales told about the queen, and it’s unflattering. Despite that less-than-stellar historical reference, the name remained in use, in France and elsewhere. Legendary English ballerina Dame Margot Fonteyn was born in 1919. 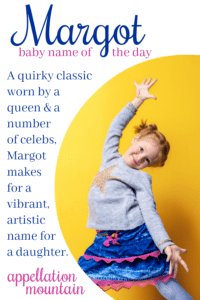 She initially adopted the stage name Margaret, but the prima ballerina of the Royal Ballet is remembered to us by her birth name. She was wildly famous in the 1950s; and then Rudolf Nureyev defected from the Kirov Ballet. Despite a nearly twenty-year age gap, the pair danced together in Giselle in 1962, and became an even bigger international sensation. And yet, Fonteyn doesn’t get credit for popularizing the name. Instead, it peaked in the 1930s, barely grazing the US Top 500. The silent T causes some consternation. In French, it’s ordinary. Think of escargot or haricot. But in English? Not so much. In 1950, Bette Davis starred as Margo in All About Eve; Grace Kelly played a character by the name in 1954’s thriller Dial M for Murder, only this time spelled with a t.
It was the era of Fonteyn’s stardom, and yet neither spelling cracked the Top 250. The highest either spelling reached was #295 in 1951. O-ending girl names can be found on the fringes over the years. Besides Margo, there’s also Cleo. But -ot ending names? This might be the only one. Maybe it’s that distinctive spelling that makes the name feel quirky. It reads as creative and sophisticated, high-spirited and maybe a little edgy, while remaining traditionalish. It’s the perfect choice for Gwyneth Paltrow’s character in The Royal Tenenbaums. All of the characters are accomplished, but eccentric. When the 2001 movie came out, Margot was at the height of popularity in France, but hadn’t cracked the US rankings since the 1960s. There’s a tiny uptick in the name’s use around 2001/2002, but Tenenbaum wasn’t enough to take this one mainstream. The Countess of Oxford and Asquith, wife of the British Prime Minister in the 1910s. Model-actor Margaux Hemingway was born Margot Louise, but changed the spelling to reflect Château Margaux, the wine that inspired her name. Actor Kidder, best known as Lois Lane in the 1978 version of Superman. Margot Robbie, known for her performances in everything from Suicide Squad to I, Tanya, for which she received an Oscar nomination. The name appears in Evelyn Waugh’s 1928 novel Decline and Fall; Nicole Kidman played the title character in 2007’s Margot at the Wedding. Robbie might deserve credit for the name’s recent rise – and our tendency to use the -t spelling. But here’s my best guess: the name owes its recent revival to the good ol’ 100-year rule. In brief, it typically takes about a century for a name to peak in use, fall out of favor, and then be re-discovered anew. The o-ending helps, as does the name’s nickname-proof style and vaguely French sensibility. It feels classic, but creative; traditional, but still daring. 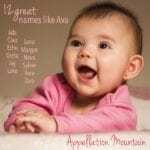 It’s more popular than ever today, a stylish possibility for parents seeking a fresh and modern name with history galore. Would you give this name to a daughter? What’s your favorite form of Margaret? First published June 12, 2013, this post was revised substantially and re-posted on October 23, 2018. We have a Margaret called Margot! We love the name. It’s “fresh” (as in not popular) but also feels classic), an homage to my FIL’s French family/last name, and gives our daughter naming options as she grows older! Only problem now is what to name her baby sister due to arrive in a couple months!!! Don’t forget the beautiful Margot Robbie! Highly considering Margo for our second daughter. We have a Dianna Rachel and Margo just seems to go right along with the classical, elegance of Dianna. Her name would most likely be Margo Lanell or Margo Beatrice. Still undecided on the middle name. My mom is Margo Lee! Not my very favorite name, but pretty. My mom was named after her mother, Margaret. When grandma was ill and hospitalized as a child, the nurses called her Margo. We opted for Margaret in the middle for Fiona because my sister’s middle name is also Margaret. It made Fi thefourth generation of Margaret/ Margo. My daughter, Margot, was born 7 weeks ago. She was almost an Eleanor but I dislike “Ellie” so I asked my husband his opinion on Margot. He loooooooved it. I had no idea it would go over so well with him. It seems to be his favorite name, ever. I’m really pleased with her name. It’s easy to say and almost everyone understands the “T” is silent. Her full name is Margot Iris; she was born right when the irises were in bloom. Oh, this is funny. I forgot I ever wrote this. Update: My nearly 5 year old Margot Iris loves dinosaurs and horses, and has since she was a baby. I thought she might outgrow the dinosaurs and horses by now, but they’re still going strong. Another update: we had another little girl in 2016 who is now nearly 2. We named her Eleanor Xanthe, and everyone calls her Eleanor after all. I highly dislike Margot/Margo/Margaux. The sound is just unappealing to me. I don’t like Marg [*shudder*], Marge, Margery/Marjory, or Margie either. Oddly though, I adore Margaret. Margot is on our short-list should we decide to go in for round 2. Margot just seems spunky to me. Margot is very elegant classy, but I fret about the teasable “maggot” look of that spelling, though the upstart Margo seems less authentic. 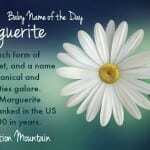 As a nn for glorious Marguerite (a pearl-and-daisy name in one) I love Margo. Ack, you’re right Eva! You’re right about the spelling issue – though I’m fond of the extra ‘t’ … But I’m partial to Marguerite, and I’d been tempted to used Greta or Greer as a nn. I love Margo(t)! It’s a beauty, full of quirky charm. If I had a daughter this would be my first choice, possibly as a short form for Marguerite, but more likely on its own. Update: I have a Marguerite, born in May. We haven’t decided if we are going to call her Maggie or Margot yet. Margot and Margo are wonderful. The only one I know of goes by Margarita in Spanish conversations and uses Margo the rest of the time. I think Margot is an up-and-comer – I see the name being bandied about with increasing frequency on name forums. Both Margot and Margaux became wildly popular in France not long ago, peaking around 1999-2000 but still in the top 100 today I believe. Our daughter would quite possibly be a Margot if the name didn’t sound odd with our surname. I notice your entry doesn’t mention the Margo spelling, which I think has been used fairly widely in the US as well. I’m not sure when it first appeared, though, or whether it has a better chance of getting popular than Margot. I love Margot, always have. I like the “o” endings in general, and I especially like her enduring classic quality. Would definitely use Margot!